From a highly anticipated river revitalization project in Chicago to a completely repurposed mall site in a tiny Connecticut town, projects revolving around public spaces are always feel-good stories. Who doesn’t enjoy a new, clean space to people-watch? Or better yet, catch some July 4 fireworks? The Architect’s Newspaper picked six completed projects that exemplify what a good public space entails. 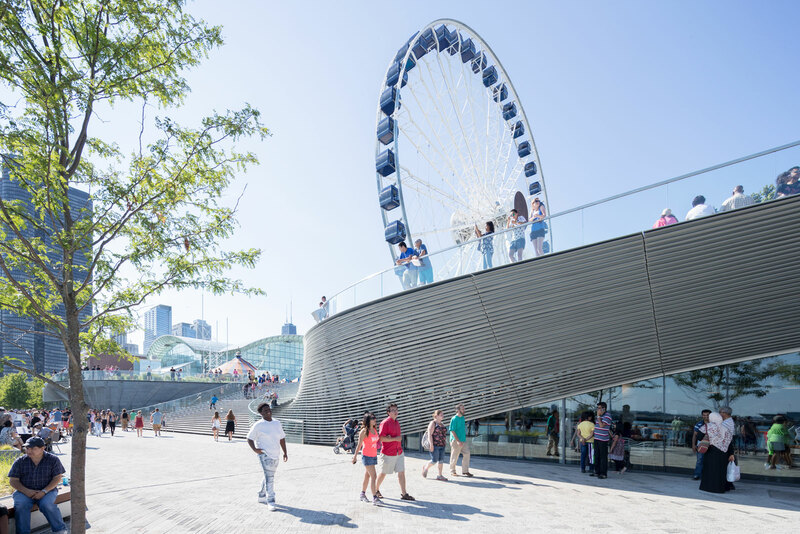 The first phase of Chicago’s popular tourist destination, Navy Pier, is now complete. James Corner Field Operations is the lead designer on this multi-year project, along with collaborators nArchitects, Gensler, Thornton Tomasetti, Fluidity Design Consultants, Buro Happold, and graphic designers Pentagram. The design includes an extensive renovation of the exterior public promenade, and this first phase includes a Wave Wall, a glass info tower, a new plaza near the base of the pier, and new Lake Pavilions that act as boat ticket kiosks and shaded rest areas. 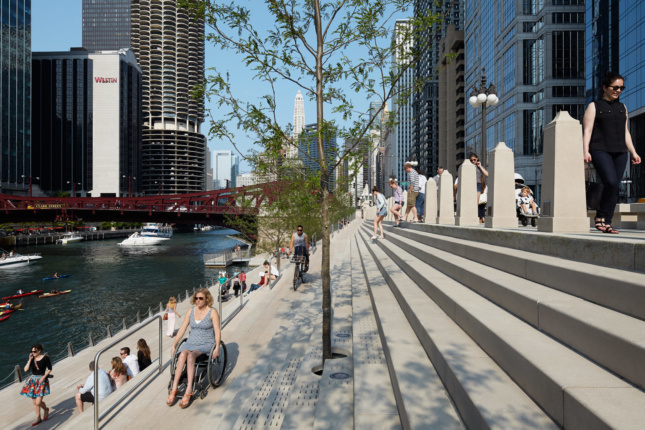 The recent completion of Phase III of Chicago’s downtown riverfront redevelopment featured a new mile-and-a-half public park, the Riverwalk. 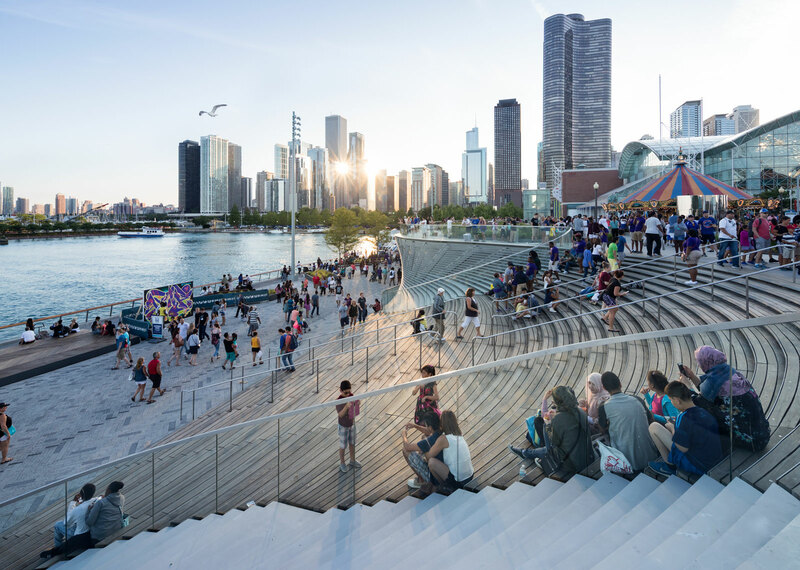 Led by Chicago-based Ross Barney Architects and Watertown, Massachusetts–based Sasaki Associates, the Riverwalk is divided into separate “rooms” between the bascule bridges and has a large interactive water plaza. Previous phases led to new development along the water, including restaurants, bars, and the River Theater, a staircase-ramp bridging upper Wacker Drive and the river. This latest development is part of an overall goal to completely overhaul the Chicago River, with an aim of a clean, swimmable river by 2040. 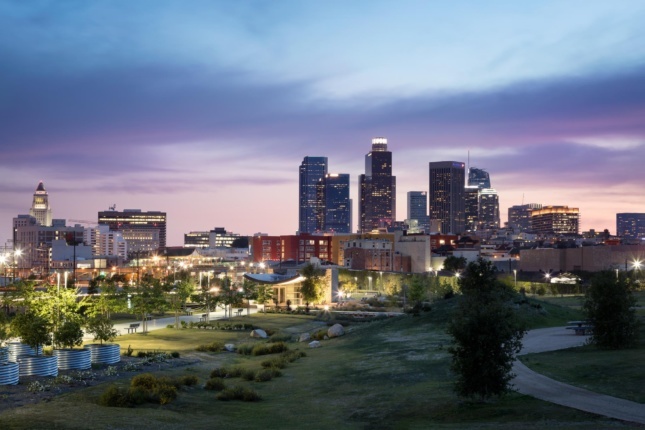 The completion of the Los Angeles State Historic Park caps off a two-decade-long saga for local and state officials and residents. The current iteration of the park has been in development since 2005 and is the first California State Park in the City of Los Angeles. It is located on a multi-layered historical site that originally housed an indigenous settlement home to Los Angeles’s Tongva indigenous community. The park sits along a broad, gently-sloping plane that connected the Tongva’s main settlement in the vicinity of today’s Union Station with the Los Angeles River, roughly one mile away. 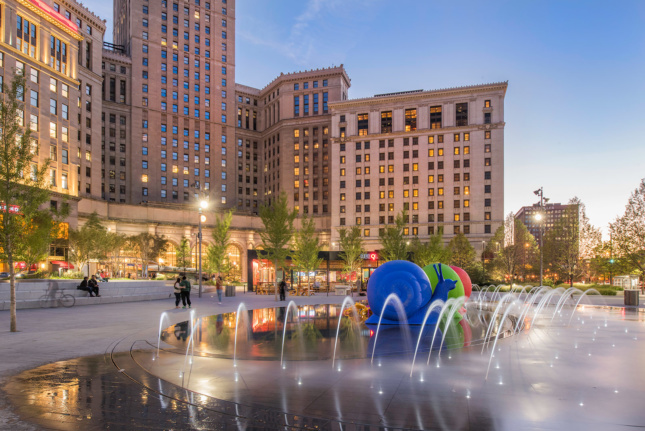 As a part of an effort to connect Cleveland’s public spaces to Lake Erie, the city’s downtown now has a new civic space—a 10-acre park designed by James Corner Field Operations, the team behind the wildly successful High Line Park in New York City. It also includes a café designed by New York–based nARCHITECTS. The design sees four smaller traffic islands in between the wide lanes of Superior Avenue (now restricted to public transportation) and Ontario Street (pedestrian-only now). The much-beloved spinning Astor Cube (formally known as The Alamo) is back at Astor Place, a plaza that has also undergone a redesign from New York-based WXY and the city’s departments of Design and Construction (DDC), Transportation (DOT), and Parks and Recreation (NYC Parks). 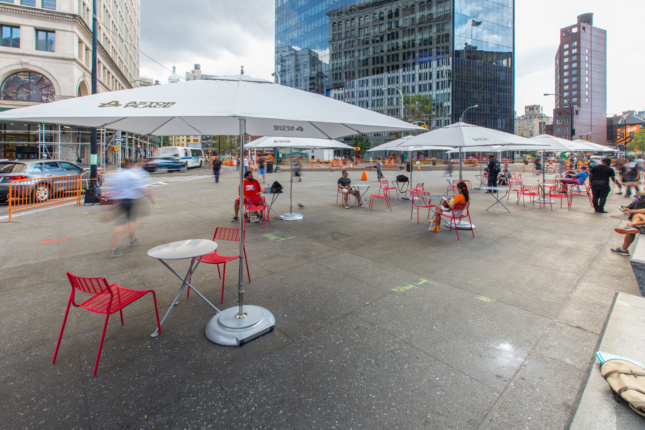 The plaza now features a 42,000-square-foot pedestrian-oriented streetscape, a reconstruction that was completed as part of an effort to upgrade infrastructure in the city and provide city dwellers with more public space as the city becomes denser. “We have now made the plaza space more welcoming for pedestrians and we have brought back distinctive elements—like the iconic Cube—that have long made this such a special gathering place and gateway to the East Village,” said DOT Commissioner Polly Trottenberg at the ribbon cutting ceremony. Cities looking to repurpose defunct mall sites can take a pointer or two from a city in Connecticut. 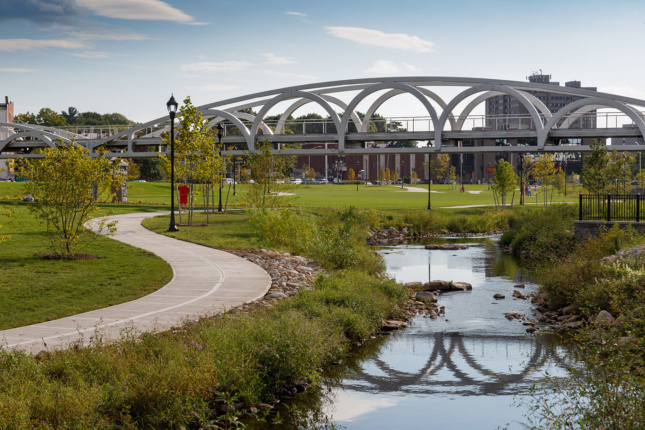 In Meriden, a town halfway between New Haven and Hartford, city leaders transformed a former mall and brownfield site into a resilient 14.4-acre park complete with pedestrian bridges, an amphitheater, a remediated landscape with a flood-control pond, and drivable turf for food trucks and farmers markets. It was an expensive ($14 million) and extensive overhaul, but is one that has brought back green space to the community.